There is nothing printed on the back of this card. The engine is a ‘Whitworth’ or ‘Waterloo’ or ‘6ft Jumbo’ or ‘Small Jumbo’ but it has lost its LNWR numberplate and has not yet, it seems, got an LMS number. It is in plain unlined black. So where is it? Any other details? 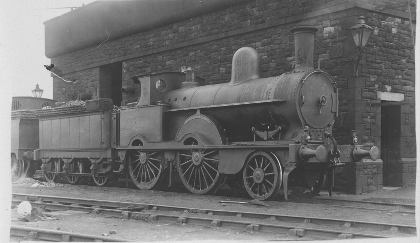 The stone-built coaling stage/water tank and the rear end of a Furness 0-6-2T suggest Workington to me. The engine is carrying express passenger lights, perhaps prepared for a trip to Carlisle over the M.& C.Rly.